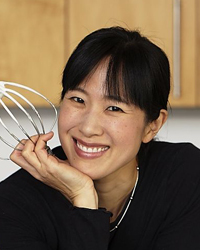 Joanne Chang of Boston’s Myers + Chang restaurant and Flour Bakery + Café tells Food & Wine about the best songs to play at a party, her famous sticky buns and how to crack two eggs at one time. Be sure to have a great playlist that shuffles the entire time, and is long enough that you don't have any quiet gaps in the festivities. The right music can make your party memorable and fun. My husband Christopher does most of our playlists, but we tend to pick songs that are fun, poppy and bright. What dish do you get the most requests for? By far the sticky buns! I think they’re so popular because we start out with a brioche dough, then we sprinkle the inside with a little brown and white sugar, a touch of cinnamon and toasted chopped pecans. Then we bake the whole thing in goo, which is water, honey, heavy cream, brown sugar and butter, until the whole thing becomes really sticky and thick. The other nice thing is, they are definitely sweet, but they’re not crazily, sickeningly sweet. The pecans help cut through the sugar, and the brioche is unsweetened. Baking with Julia by Julia Child. I had my first pastry job at Rialto when she was writing the book and filming the TV series. Through various Boston and Cambridge restaurant connections I got to witness part of the book being tested in Julia’s kitchen. It was a great opportunity to see Julia, who’s obviously an icon, and to watch behind the scenes. About three years later I decided to open my own bakery. The whole process of opening any restaurant is very long and very hard. I didn’t realize when I first started out how discouraging it could be. You have to deal with so many things that have nothing to do with baking, like attorneys, leases, equipment, regulations, just a bunch of crazy stuff. But that book never failed to re-inspire me. Seriously, I’d pick it up and within about 3 minutes I’d be like, “OK, no, this I what I want to do! And this is why I want to do it.” There are a lot more modern, fancier books out there, but in terms of a book that I go to that brings me a lot of happiness, that book definitely does it. How to crack two eggs at a time. It’s super easy: You just hold one egg in each hand, crack them both simultaneously on the countertop or the edge of the bowl, and then you open it with your thumb and fingers. It’s fun!